This Viewer Shop comes from Joe, who is the communications director for the Spar Shop at the Historical Seaport in Aberdeen, Washington. The Spar Shop at the Historical Seaport specializes in ship masts and spars, as well as custom columns and poles. We also provide custom milling of gaffs, booms, timbers, beams and cants. Our 10,000-square-foot drive-through shop is one of a kind, featuring the largest tracer-lathe in North America. 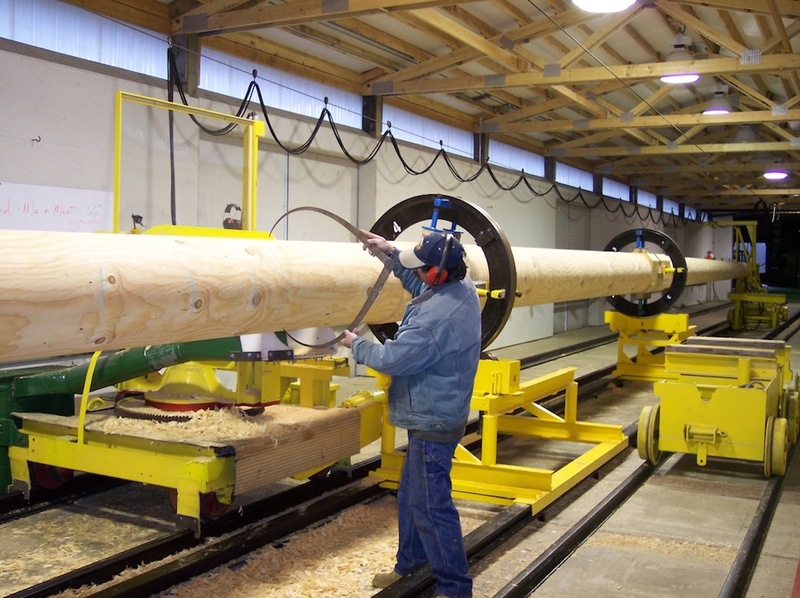 We can turn logs up to 40 inches in diameter and 122 feet in length. With our two sawmills, we can mill logs as large as six feet in diameter, and create timbers as long as 100 feet or more. Our Job Shop offers custom fabrication of movie set pieces, museum exhibits and thematic elements for custom homes and commercial buildings as well as short-run-production woodworking projects. You can learn more about the Spar Shop at TheSparShop.org. Spar Shop Operations Manager Kent Wall checks the diameter of a log in North America’s largest tracer mill, which can handle logs up to 122 feet long. Spar Shop crew re-position a yard on the tracer lathe, North America’s largest. 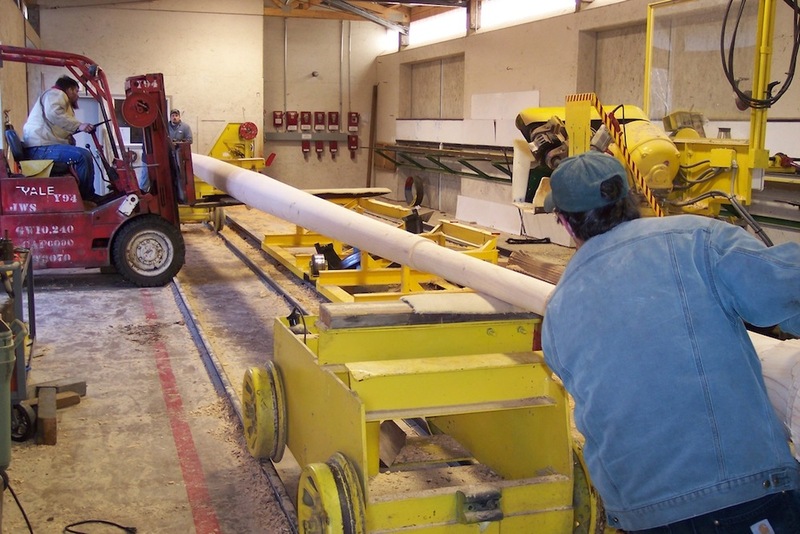 The Spar Shop turns large logs into masts, spars, booms, and gaffs for sailing ships. 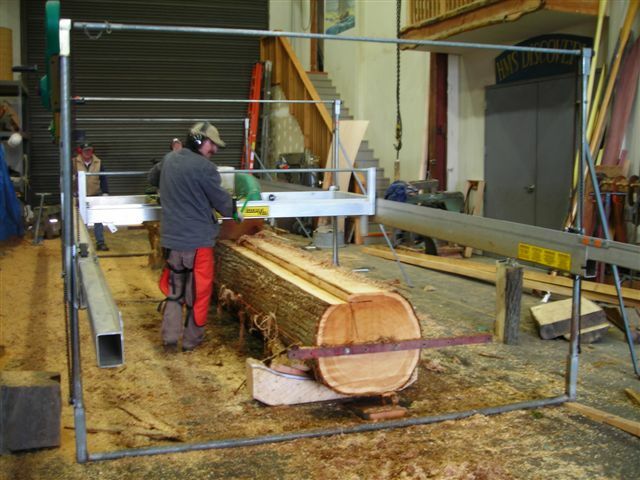 Spar Shop Operations Manager Kent Wall cuts a cedar log into custom-sized planks with a 30-HP Lucas Mill sawmill. Impressive! Ive always wanted a tool holder that runs on a railroad. Yet, being a handtool guy, I would have to rig a treadle or wheel to turn the poles. Hmmm, a wheel with four guys walking inside might do it. WOW! That is really amazing. It never occurs to you how things that large are built until you get to see it. I bet seeing that thing spinning is a little scary the first time even with steady rests. I’d like to see how it’s mounted on the drive end. What rpm does it turn at? And you think you have a sawdust problem! Wow! I wonder where I can get one of those? Just the thing for the “Man who has it all.” Remember kids, Father’s Day is coming!! Caption: Major League Baseball considers drastic measures to reduce bat breakage. Wow thats cool. I’m from Corpus Christi where the Columbus ships are docked. We were lucky not to loose the Nina in the fire. Thanks for the cool work you guys do up there. Wow… I thought my little boatbuilding efforts amounted to something.